At the bottom of the Samsung Galaxy S8’s screen are three important buttons: the Device Function keys. They’re always present for you to navigate your phone even though the backlight might switch off to hide their presence. Whatever else you’re doing on the phone, these buttons can take over. Besides the Home button, the other buttons are equally cool. The button to the left of the Home button is the Recent Apps button. 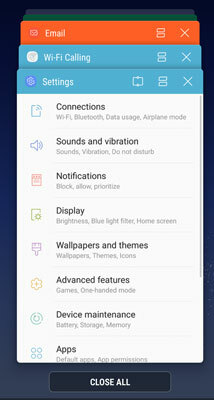 Tapping the button brings up a list of the open apps. This is handy to navigate between running apps. This figure shows a typical screen of recent apps. You can scroll among the open apps by flicking up or down. You can jump to one of these apps by tapping somewhere on the image. You can also shut down one of the apps by tapping the x on the upper-right corner. You can shut them all down by tapping the link at the bottom that says Close All. The Device Function keys are cool because they light up when you’re touching them or the screen, but fade away the rest of the time. The Back button on your phone is similar to the Back button in a web browser: It takes you back one screen. As you start navigating through the screens on your phone, tapping the Back button takes you back to the previous screen. If you keep tapping the Back button, you’ll eventually return to the Home screen.